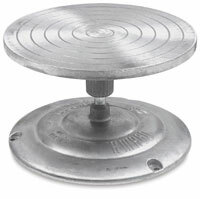 This decorating wheel features an all aluminum 7" diameter head with concentric circles, rotates on a ball bearing, and is weighted at the rim for greater momentum. It has drilled extensions for attaching to table. The wheel shank is grooved to accommodate a small round belt for mechanization.